Cookie and I zoomed five hours down I-35 to Oklahoma on Monday. When I left, I was still feeling a little sour about being the only single person at last weekend’s Friendsgiving. Sharing that dark drive through Kansas with just my loyal co-pilot and Jad and Rob from Radiolab was pretty nice, though. This margarita has been on my mind ever since I saw it in Bon Appetit’s November issue, but I didn’t get around to making it until right before I left town. I couldn’t part with such an irresistible cocktail, so I poured it from its gold-rimmed glasses into a decidedly less glamorous pickle jar and stored it in my trunk. It glows at me like pink kryptonite every time I open my parents’ refrigerator. 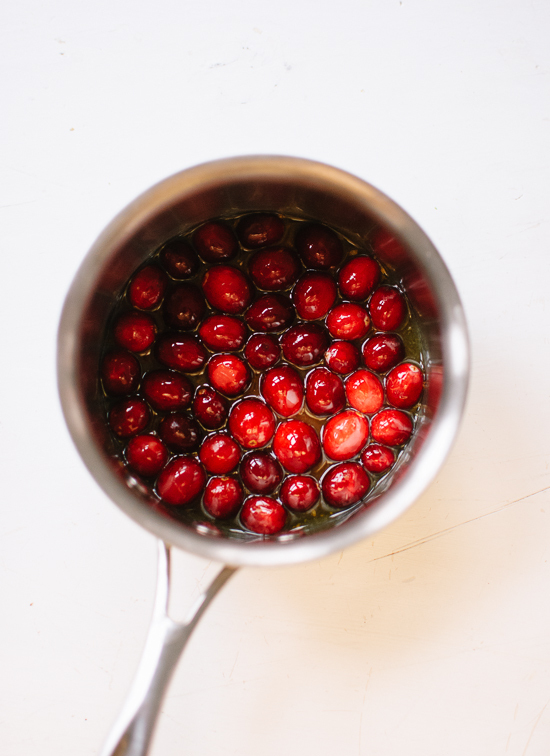 The recipe calls for fresh cranberries, which are cooked down into a ruby red jam that lends far more flavor than cranberry juice. 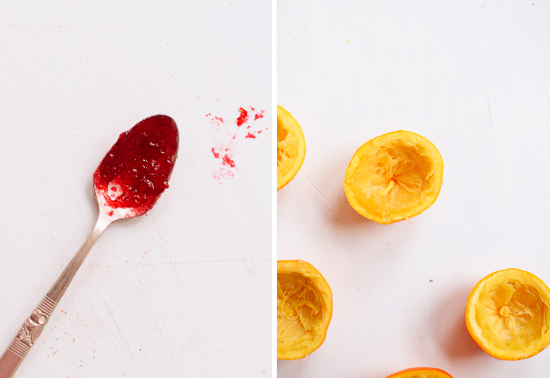 Once you’ve made the jam, just shake it up with tequila, fresh orange juice and lime juice. Then strain it into a glass rimmed not only with a blend of salt, sugar and warming spices. 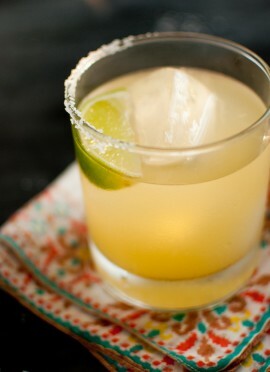 You’ll end up with a festive spin on my favorite margarita recipe. This jam-in-cocktails concept seems promising. Very promising indeed. I can’t wait to try a blueberry jam version next summer. Of course, I substituted agave nectar for the sugar in the jam since agave nectar and tequila are such a natural pair (they both come from the agave plant). I went ahead and doubled Bon Appetit’s jam component in the recipe below so you’ll have plenty to share with family or friends. Let the holidays begin! 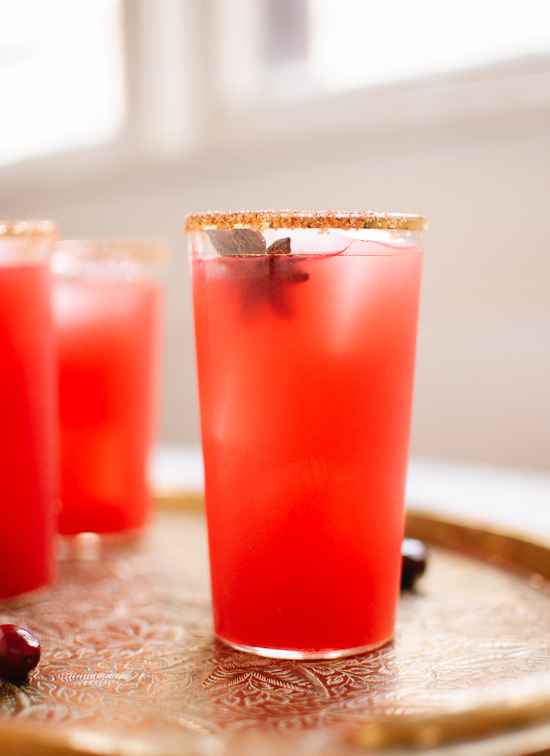 Simple and stunning cranberry margaritas made with fresh cranberries. This recipe yields 8 small, 4-ounce drinks (or 6 drinks if your glasses are the same size as mine). You will need about 6 medium oranges and 5 medium limes. To get a head start on the drinks, make the cranberry jam up to 5 days in advance. 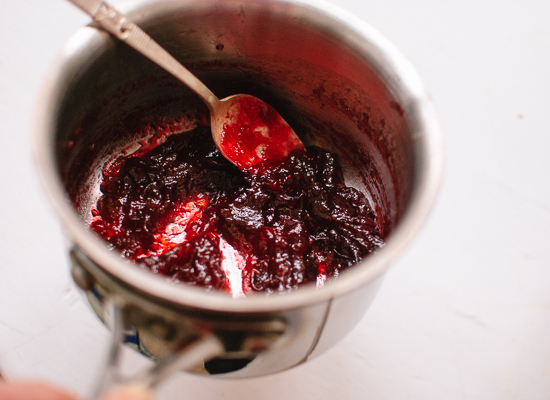 Make the jam: In a medium saucepan, bring cranberries, agave (or sugar), orange juice and ½ cup water to boil. Reduce heat and simmer, stirring occasionally, until thick and jammy, about 20 to 25 minutes. 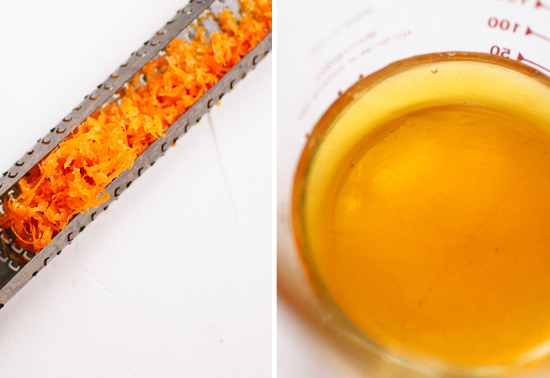 Remove from heat, stir in the orange zest and set aside to cool. 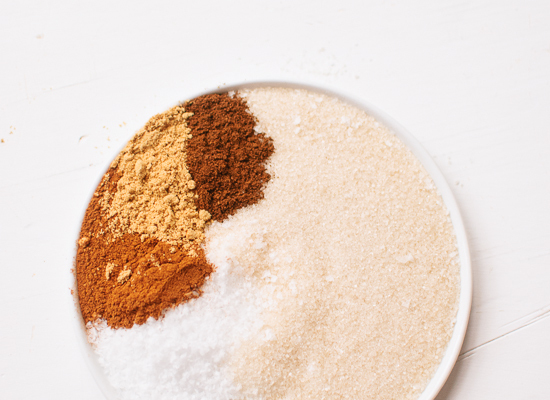 Make the sugar and spice blend: On a small, flat plate, mix together the salt, sugar, cinnamon, ginger and cloves (or allspice). Line the glasses: You will need 8 old fashioned/small cocktail glasses. 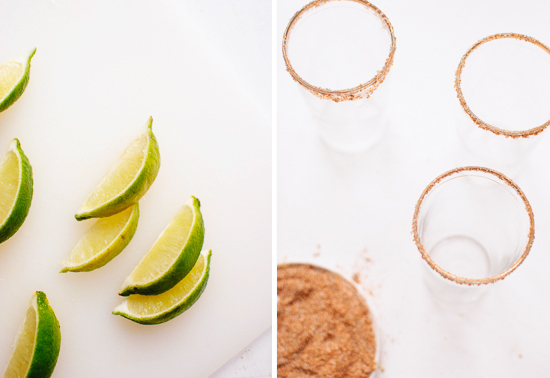 Rub a wedge of lime along the rim of each glass, then dip it into the sugar and spice blend. Repeat for remaining glasses, then fill each with ice (assuming that you will be serving the cocktails immediately). 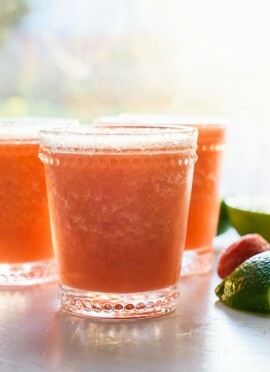 To make each cocktail individually, combine 1 tablespoon (½ ounce) lime juice, 2 tablespoons (1 ounce) orange juice, 3 tablespoons (1 ½ ounces) tequila and 2 tablespoons cranberry jam in a cocktail shaker. Cover and shake until outside is frosty, about 30 seconds. Strain into prepared glass and serve with a star anise. Recipe adapted from The Red Cat’s recipe in Bon Appetit. Recommended tequila: Espolón, Milagro or any other 100 percent agave silver tequila. 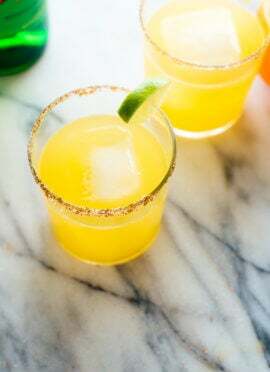 To make four drinks at once: combine ¼ cup lime juice, ½ cup orange juice, ¾ cup tequila and ½ of the jam in cocktail shaker. Fill the shaker with ice, shake vigorously and strain the mixture into 4 prepared glasses. To make a pitcher of margaritas (pretty sure this will work well): fill a small pitcher with ice and pour in the tequila. In a cocktail shaker or mason jar, shake the orange juice, lime juice and all of the jam well (or blend it all up in a blender). Strain the mixture into the pitcher. Stir well before serving. Storage suggestions: Leftover jam should keep well, covered, in the refrigerator for a couple of weeks. It would be good on toast or oatmeal. P.s. I’m trying to be better at social media stuff. Here’s a Thanksgiving facebook round-up, fall recipe pinterest board annnnnd a brand new cooking tips and tricks board. Kathryne, this is drop dead gorgeous and calling my name. You are a wizard once again! Happy Thanksgiving my friend! Why thank you, sweet Melissa! Happy Thanksgiving to you and Kevin and Hallie! Megan, you have to make these margaritas ASAP! Sooo good. This looks and sounds like perfection! Thank you for sharing! 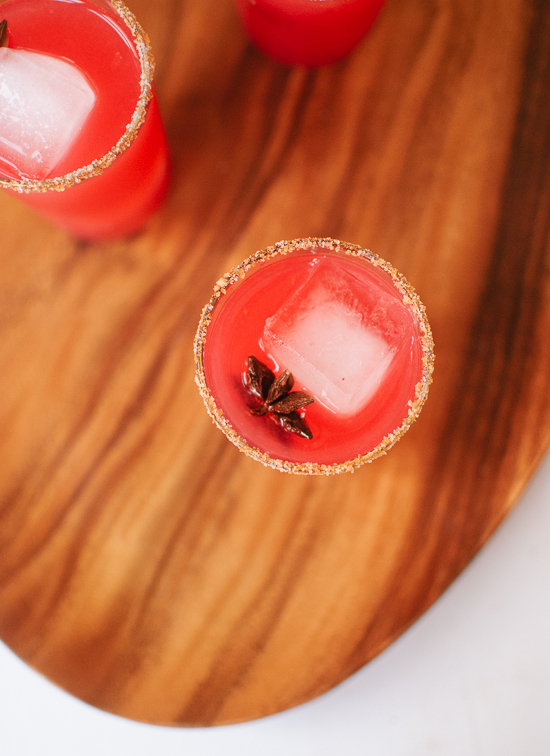 These drinks look so festive and gorgeous! Oh, I wish you had been there, G! Hope hope hope to see you at Christmas time! 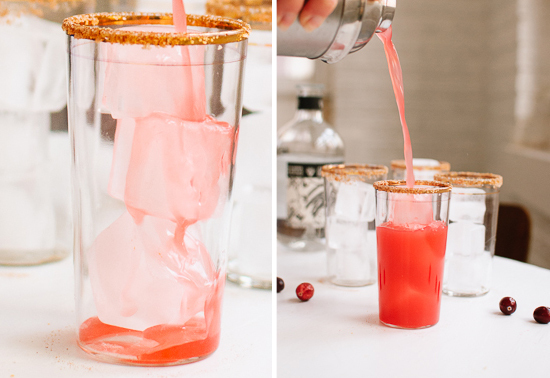 This drink is so perfect for the holidays! LOVE! Oh wow! The cranberry sauce I’ve adopted into my traditional spread is just like this jam, but with freshly grated ginger. I feel like THIS is what I will make with leftover cranberry sauce this year! Move over, sandwich-spread. Shakin up some margaritas! Delicious! Happy, happy Thanksgiving to you my dear! I bet these taste as beautiful as they look. Great idea for the holidays! I think our brains were on the same wave length this week (just whipped up a cocktail with some cranberry sauce). I have to say I’m a big tequila fan. I’d always choose a margarita over any other drink. So, I may have to make a batch of these tomorrow. The last photo you posted on your facebook round-up made me laugh out loud! Thanks for inspiring me to get some tequila for my bar! Glad you appreciated the photo. :) I caught that squirrel eating my jack-o-lantern back in Oklahoma. Fat rascal. I love the star anise garnish! This reminds me of a drink I had at a hotel and have been trying to replicate ever since…I’ll have to try it. Thanks for the post! 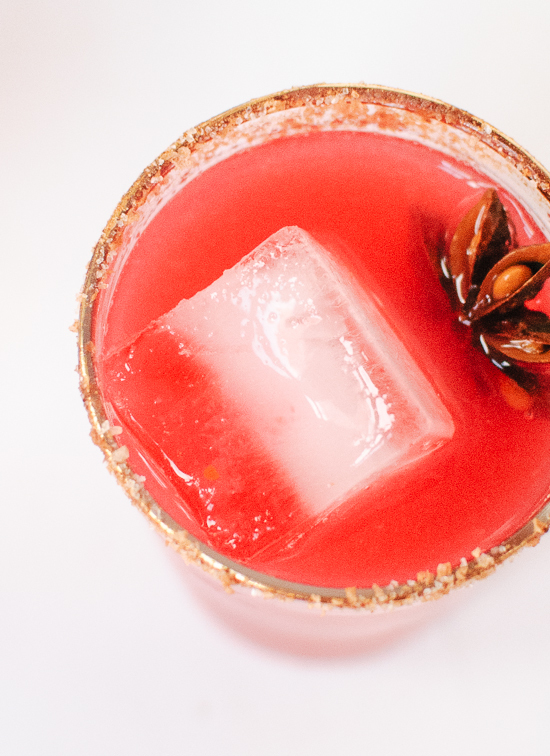 Oh how fabulous – what a wonderful twist on a holiday tipple. Such a pretty colour. And such beautiful photos! LOVE! I love, love, love your cocktail posts, Kate! I mean look at this absolutely gorgeous red gem called margarita. I hope you and your family had a happy Thanksgiving full of delicious food and tasty cocktails – like this beauty! These were a hit at our thanksgiving pie party last night! Thx! Love the rim spices! Oh yes, a few of these margaritas is just what my Thanksgiving needed! Thanks so much for the recipe. Mae “doesn’t drink mixed drinks”, but I could tell this hit the spot. ; ) Thanks Kate, we had a great night! Keep up the good work. You two cracked me up. Thank you! Great drink, I am trying it. Can this be made without alcohol? Hi Martha! I haven’t tried, but I think you could make a good mocktail with these. Maybe try it with a little water instead of alcohol?